1. I need 10 Participants by Monday, November 17th. 2. 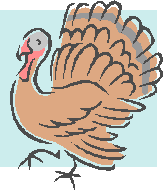 Each Participant will be given or mailed a Turkey Trot Packet. 3. Take your packets with you while you are visiting your friends and family over the Thanksgiving holiday. 4. Collect at least $100 in orders (an easy task since everyone will be thinking about Christmas and looking at sales ads). 5. Turn in all orders & payments to me by Sunday, November 30. 6. Additional prizes for bookings, highest sales, & most sales. Contact me now to get in on this fun event! An easy way to get free products! Your own orders count as well, so if you were thinking of getting some Christmas gifts, this is a good way to get freebies as well!